40 minute Qigong Routine fills your body with energy. Also Includes Healing Qigong Meditation, Taoist Stretching. Natural Qigong Walking. Special Effects Animation enahnces "your" qi-energy dramatically. Amazing Music facilitates sacred practice of Qigong. This is a totally revolutionary Qigong Healing Energy Experience and WILL launch your practice into hyperdrive! 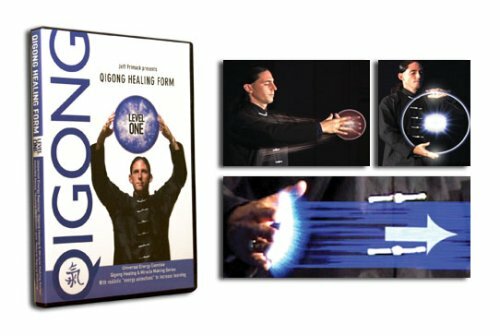 Aside from the raw power of this Qigong Style on its own, when you watch this SPECTACULAR QIGONG DVD, your mind (visually) is given specific imagery that precisely teaches you how to increase the Qi-Energy in each movement. These animations go far beyond simple beauty... they increase the Qi-Energy you feel dramatically. Having more Life-Force Energy is the #1 secret for maintaining a powerful Immune System. The Metabolism (Qi) is accelerated and you will feel the warm energy and blood pulsate through your arms & legs with increasing vigor each day. Over 10,000 people have studied this particular Qigong Routine in LIVE seminars and many seasoned experts have said it is the most powerful energy-medicine they've ever learned. SSQ Level-1 Qigong Healing DVD comes with two voice overs, Traditional & Inspirational. The amazing music of both versions offer you a choice of teaching style and ambience. Taoist Streching opens and unlocks every muscle and joint in your body. 5-Element Qigong Healing Meditation takes you deep into Breath-Based Visualization Healing.Natural Walking Qigong teaches you to walk around your neighborhood, while collecting Qi. This video is outstanding, as it is clear, concise and the techniques deliver. The graphic animation helps even a first time practitioner visualize, focus on and feel the qi right away. The instructions are word for word accurate, detailed and easy to follow. The inspiring background music by Helpling and Jenkins is a refreshing addition to Jeff's teachings. I've had all the same experiences as the other people and more through incorporating Supreme Science Qigong into my daily routine. In addition to that, I work closely w/a local massage school & get to preview the products they buy. Hands down the SSQF Level 1 DVD provides SO much value in the instruction as much as the technology & divine inspiration that went into creating their movie collection. I've seen the competition and while they might "appear" more authentic or traditional, this DVD highlights the subtle principles of cultivating QI unlike any other so you can FEEL the tradition that is transmitted through the tv. Opens the mind for all possibilties. Take control of your health with this powerful healing form! I was very skeptical of Jeff Primack's Supreme Science Qigong. In fact I was completely cynical and attended a seminar purely for the inexpensive continuing education credits needed for my license renewal. I could not have imagined how my mind and my life were about to change! When Jeff began to teach us the Level-1 Healing Form my eyes were forced open. In the first position of the first posture, Empty Force, I was suddenly jolted out of my cynicism. I FELT A FORCE LIKE REPELLING MAGNETS HOLDING MY HANDS APART!!! I played with it, pressing inward, pulsing my hands softly toward each other to make sure I was really feeling something. I know my face must have looked like a kid with a new toy. It turned out to be much more than a toy. I vowed to myself I would practice this Level-1 Form for thirty days straight and BOUGHT THE DVD SO I COULD BE SURE I DID IT CORRECTLY! I had suffered for years with the physical cosequences of multiple major car accidents and very poor posture. I relied on regular chiropractic visits to manage the chronic tension and pain in my neck, shoulders, and upperback. I frequently suffered with headaches and a painfully stiff neck. AFTER JUST A FEW DAYS OF PRACTICE I REALIZED MY NECK, SHOULDERS, AND BACK WERE NO LONGER TENSE AND SORE! AND I WASN'T HAVING ANY HEADACHES!!! I HAVE NOT BEEN TO THE CHIROPRACTOR SINCE! I wanted to share this powerful practice with others so I worked hard and now am a certified Level-3 Supreme Science Qigong Facilitator. I COULD NOT HAVE DONE IT WITHOUT THE DVD! AND I STILL PERIODICALLY PRACTICE WITH THIS LEVEL-1 DVD TO REFINE MY FORM. JEFF'S DEMONSTRATION AND VERBAL INSTRUCTIONS COMBINED WITH THE REVOLUTIONARY GRAPHICS PROVIDE AN UNDERSTANDING AND EXPERIENCE OF QIGONG SUPERIOR TO AND MORE QUICKLY THAN ANYTHING ELSE AVAILABLE!!!!!!!!! If you want to improve and control your own health I very highly recommend this DVD.